Tis the season… to feel overwhelmed, exhausted and of course… hungry! Time with family and friends is such a rare treat, why spend it in the kitchen? Let Chef Scotty set you up for a stress-free holiday dinner. Need to add on? 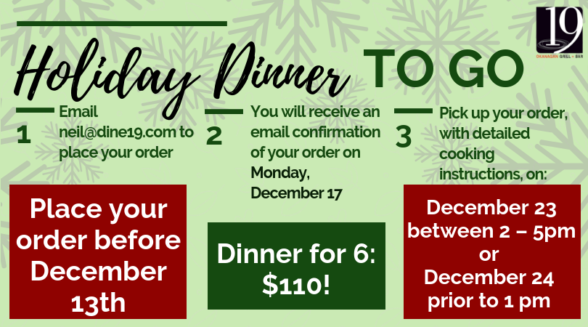 We will gladly customize your holiday meal package to accommodate your needs. *We make all our sauces and stocks from scratch without the use of traditional flour. All the best this holiday season, from Neil, Chef Scotty + the entire 19 Okanagan team!